On most Cisco switches it is possible to create logical connections that are made-up off different physical interface. It is required that these interfaces share the same speed. Most Cisco switches support a maximum of 64 EtherChannels. These interfaces do not need to be contiguous, or even within the same module. Each channel must be made up of a minimum of 2, and a maximum of 8 interfaces. Best practice is to use groups of 2, 4 or 8 interfaces. This will provide optimum load-balancing. The load-balancing can be bases on layer 2, 3 or 4 information. Having different load-balancing methods for different EtherChannels on a single switch is not permitted. Changes to the load-balancing method are applicable for all EtherChannels. The objective of this lab is to understand and learn to configure EtherChannel, Link Aggregation Control Protocol (LACP), and Port Aggregation Protocol (PAgP). 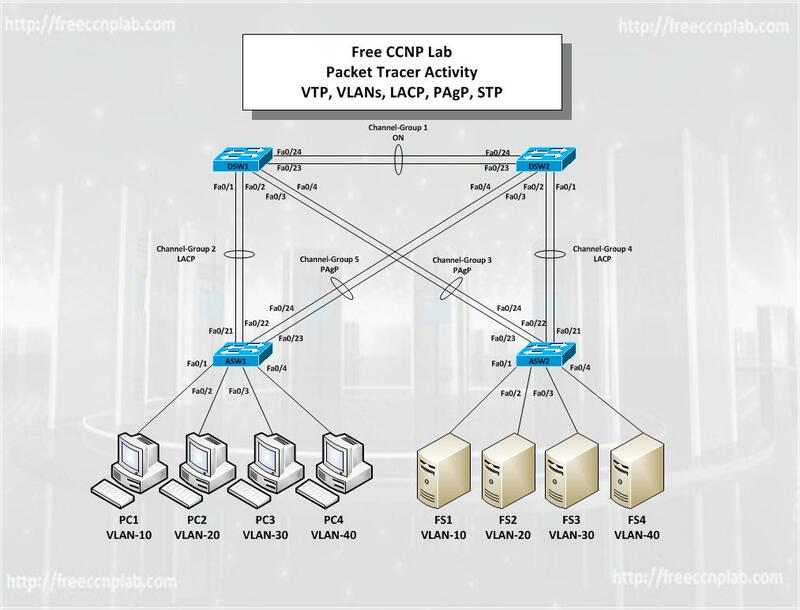 In this lab we will use Cisco’s Packet Tracer to configure multiple EtherChannels and implement LACP and PAgA between four Cisco Catalyst switches. Port Aggregation Protocol (PAgP) is a Cisco Systems proprietary networking protocol, which is used for the automated, logical aggregation of Ethernet switch ports, known as an EtherChannels. This means it can only be used between Cisco switches and/or switches from licensed vendors. A similar purpose protocol known as LACP, released by the IEEE known as 802.3ad, is an industry standard and is not tied to any specific vendor. PAgP can be configured on a Cisco switch to operate in three different modes. auto: Passive negotiation of the channel. desirable: Active negotiation of the channel. on: No protocols are used, it assumes the other side has also enabled link aggregation. PAgP does not form a bundle on ports that are configured for dynamic VLANs. PAgP requires that all ports in the channel belong to the same VLAN or are configured as trunk ports. When a bundle already exists and a VLAN of a port is modified, all ports in the bundle are modified to match that VLAN. PAgP modes are off, auto, desirable, and on. Only the combinations auto-desirable, desirable-desirable, and on-on allow the formation of a channel. The device on the other side must have PAgP set to on if a device on one side of the channel does not support PAgP, such as a router. Configure all switches to be part of the VTP domain “CCNP” with the password of “cisco”. Configure all switches to run VTP version 2. Configure switches DSW1 and DSW2 as VTP servers. Configure switches ASW1 and ASW2 as VTP clients. The two ports between DSW1 and DSW2 belong to channel group 1 and use mode on. The two ports between DSW1 and ASW1 belong to channel group 2 and use LACP. The two ports between DSW1 and ASW2 belong to channel group 3 and use PAgP. The two ports between DSW2 and ASW1 belong to channel group 4 and use LACP. The two ports between DSW2 and ASW2 belong to channel group 5 and use PAgP. On DSW1 VLANs 10, 20, 30, and 40. Confirm that the above VLANs have propagated to all switches. Assign port connecting PCs and Servers to VLANs as shown in the network diagram. Configure DSW1 as the primary Root Bridge for all VLANs. Configure DSW2 as the secondary Root Bridge for all VLANs. What version of packet tracer did you use to open the file? What is the name of each vlan?